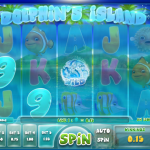 It is story time with this slots game by developer Softbet. Alice Adventure is a rendition of the Alice and Wonderland children’s story. The pastel colors are in keeping with this favorite as well as the characters and music. It is a collection of quirky sounds with bells and chimes that make players feel as though they are falling down a rabbit hole. Once there is a bonus win, it changes to an upbeat tempo. A giant brown spotted mushroom is the spin button. It responds effortlessly as it bolsters the experience. Get ready for winning spins from the start. After only a few spins, a bonus round is awarded. It will be the Drink Me Bonus that whizzes players to a room with a large Alice standing by three doors. The Drink Me bottle is shaking with bells ringing in the background. 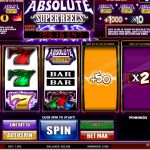 This game has 30 pay lines spread over the customary five reels and three columns. Alice is the most valuable symbol worth 1,000 coins for five icons. The Mad Hatter and Wicked Woman are next with 300 coins, while the rabbit and blue creature payout 120 coins. Players earn 80 coins for the letters A and K or 60 coins for the letters Q and J. The wild is in the form of a stamp with Alice written on it. Regular game symbols are replaced by it, although the scatter is not. A mischievous purple stripped cat is the scatter. Scatters are multipliers only with five, ten, and 25 times when they land on the reels during bonus spins and regular play. They are awarded based on whether players earn the minimum three, four or five symbols during the game. The Drink Me Bonus has players click the bottle to get things rolling. Alice shrinks after drinking the potion. 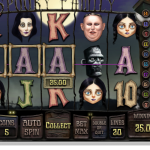 Three different options appear over three doors such as 15 free spins with one time multiplier, eight free spins and three times multiplier, or five free spins with six times multiplier. Once you choose a door it opens and the resume button is displayed. 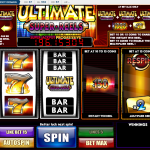 It is best to go with the most spins as possible instead of the highest multiplier. Players may not earn big payouts with the small amount of free spins. Wilds can be sticky while extending the entire reel as Alice grows during bonus rounds. It is not unusual for several to appear for the same bonus game. Big payouts occur when several wilds land at the same time with each multiplier being added to the pay line based on the original bet. There are only two bet increments including one or two cents that wages either three or six dollars. The reels spin at turbo speed with the sound effects to go along with it. No sticking or slow moving reels will be found throughout play. The animation is well-done with Alice moving fluidly as she drinks the potion or opens the bonus doors. Winning pay lines are highlighted with flashing symbols and the reels being shadowed out. There is no animation for the other characters except for their backgrounds spinning and change colors. 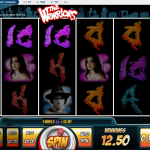 Players will be impressed with the number of winning spins in this game. The music and graphics complement each other. This game is a solid four on a scale of five.